So you’ve seen some stunning hoarding graphics in London and your now thinking of moving your company image forward to compete with the big players. Hoarding graphics can be the difference to somebody knowing of a development or not. On so many occasions potential new clients have asked me where our latest project is and instead of giving the street name I’ve said something along the lines of ‘have you not see the 10ft high mirrored chrome hoarding in London’. People can familiarise themselves with visuals of places far greater than a road name. 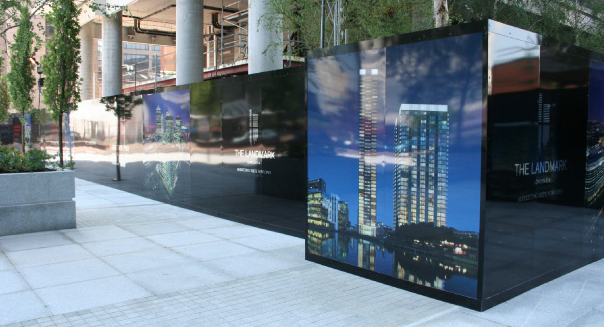 Hoardings create first impressions and what is visible externally is a reflection of the craftsmanship and design on the inside. If you see a site in London boasting a small 4ftx4ft sign nailed to a painted hoarding the chances are it’s not going to be high end apartments coming soon, its also not going to create much buzz or interest. With our creative designs and expert marketing experience we can deliver that buzz, the press, and most importantly increased enquiries and brand awareness. Since our establishment we have invested heavily in quality printers resulting in our hoarding graphics outshining the competition around London. Not only is the quality of our end product second to none but the speed owe can print at allows us to turn around large scale jobs 100+meters within days. Depending on your budget you can choose to take your hoarding graphics one step further with Lavastar. We at Lavastar now offer a bespoke solution where we can introduce lighting and sound so you really do claim all the attention around the streets of London.